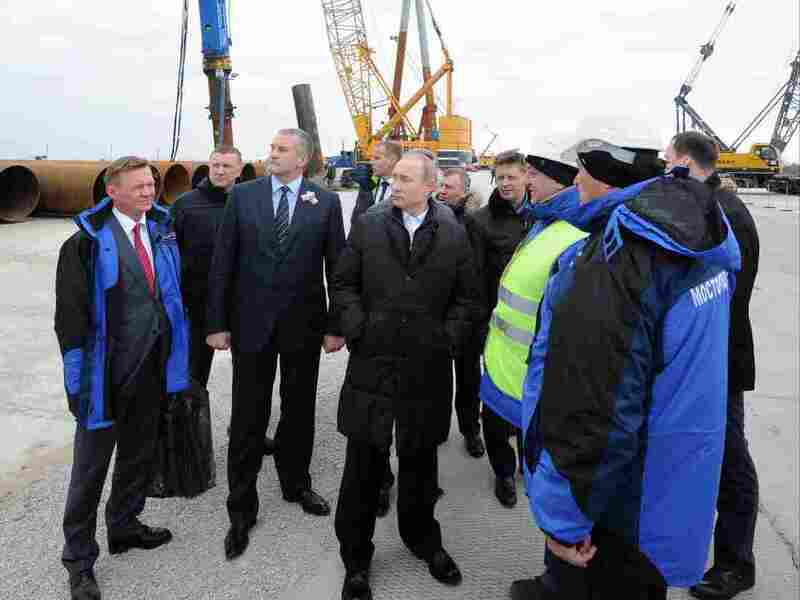 Russia's Crimea Bridge Project Beset By Engineering Worries And Labor Woes : Parallels Russia is racing to build a bridge to Crimea, the Ukrainian peninsula it annexed in 2014. The strategically vital project is beset by charges of near-slave labor for workers and engineering concerns. Russian President Vladimir Putin (center) joins Russia's federal highway agency head Roman Starovoit (left) and Crimean leader Sergei Aksyonov (second from left) on a visit to the Kerch Strait bridge construction site on Tuzla Island on March 18. The bridge will link Crimea to mainland Russia. 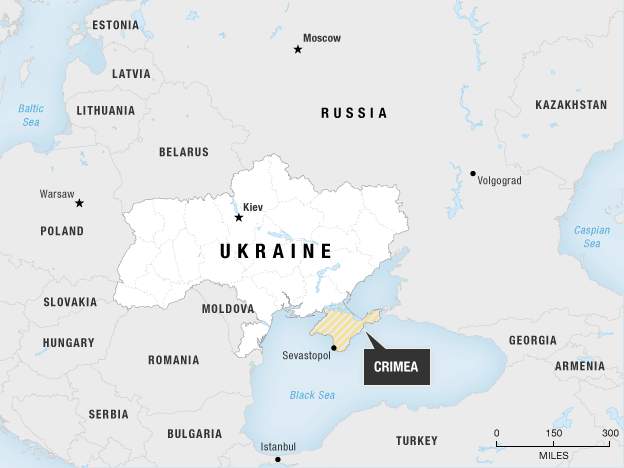 Crimea came back into the headlines this summer when Donald Trump suggested he was willing to consider recognizing Russia's takeover of the Ukrainian territory. Trump also said he'd think about lifting the sanctions the U.S. imposed on Russia after it annexed Crimea in 2014. The Kremlin has been racing to cement its control over the Black Sea peninsula. A key part of this effort is the Crimea Bridge, and it's essential to President Vladimir Putin's plan to make the peninsula a viable part of Russia. After Russia seized Crimea, Ukraine blocked most road and rail traffic to the occupied region. There was no land connection to the Russian mainland, so goods had to be delivered by sea or air, driving up costs. The Russian tourists who are crucial to Crimea's economy had to wait in long lines to ride a crowded ferry. The bridge is designed to solve all that. From the starting point on the Russian mainland, it will stretch for nearly 12 miles across the Kerch Strait to the eastern tip of Crimea. Right now, it's a sprawl of temporary causeways and bridges that bring materials and equipment to the site. Trucks load up with boulders that will shore up a narrow spit leading out to what will be the main span of the bridge. Construction director Leonid Ryzhenkin stands on a causeway, far out into the strait, near the point where the bridge will have to span a deep channel. Even in near-perfect weather, it's windy here. Ryzhenkin says that can be a challenge for the builders. The weather is interfering with the work, he says. Storms back in June kept workers off the job and construction vessels in port for days. The zigzagging route of the Crimea Bridge, seen from the Russian side, bristles with cranes and construction equipment. The $4.3 billion project is expected to be finished in 2019. Critics cite other concerns, too. Engineer Georgy Rosnovsky says the bridge is badly needed, but it's being built in the wrong place and the wrong way. He has designed other bridges and says this one could be vulnerable to earthquakes and mud volcanoes on the sea floor. The project engineers insist they tested extensively before choosing this site. They're driving pilings as deep as 300 feet into the sea bed to reach a solid foundation. The builders will have to get this one right: Putin allocated $4.3 billion for this Crimea Bridge in the midst of a financial crisis. The contract went to companies belonging to billionaire Arkady Rotenberg, a close Putin friend. Rotenberg was a prime developer of the Sochi Olympics, which ran into billions of dollars in cost overruns. Now the construction companies are being accused of mistreating workers. Vyacheslav Abdullin, a laborer from the Ural Mountain region, says the company promised decent pay of almost $80 a day, plus free meals and a place to live. In the end, he says, food and lodging were deducted, leaving the workers with little to take home. He says workers were fired for taking breaks, so they could be sent home without being paid at all. The builders promise to finish the job swiftly, with four lanes of auto traffic open by December 2018, and two rail tracks soon after. 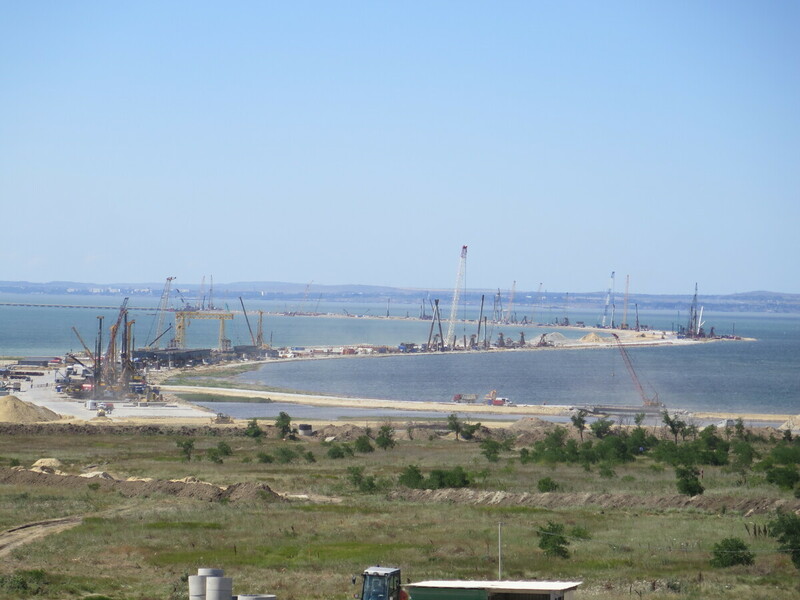 Once it's complete, they say the bridge will be able to carry 14 million people each year between Russia and Crimea.